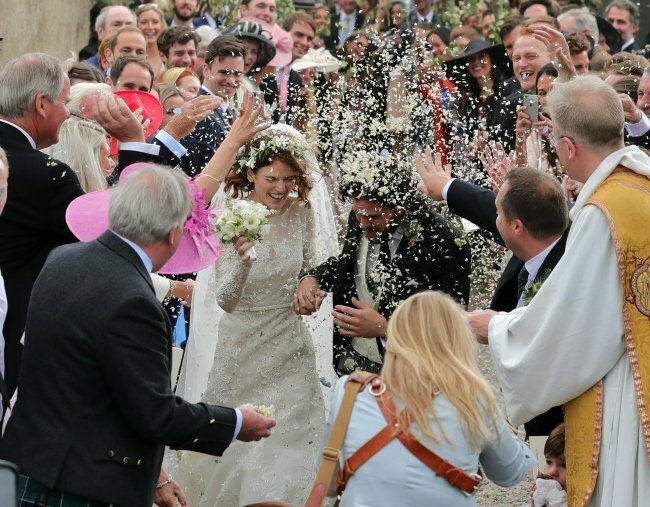 Rose Leslie and Kit Harington wedding: Everything you need to know. Everything we know about Kit Harington and Rose Leslie's wedding. It’s not every day Jon Snow and Ygritte your favourite Game of Thrones co-stars get married in an actual Scottish castle. On Saturday, Kit Harington, famously known for his role as Jon Snow in Game of Thrones, and his co-star Rose Leslie, who played his love interest in the series, were married at the bride’s family’s castle in Scotland. Kit Harington and Rose Leslie tied the knot in Scotland. Image: Getty. We have compiled all of the details you need to know about the special day. The couple were married at Rayne Church, which is nearby the 900-year-old Wardhill Castle in northeast Scotland, which is owned by Leslie&apos;s family. Leslie wore a stunning floor length gown, with lace detail around the neck and lace sleeves. The bride also wore a floral headpiece with white flowers beneath her veil, and white shoes. The groom wore a morning suit, complete with a cream vest. The wedding car was an old-school Land Rover with a traditional white bow and the words "Just Married" dangling from the front. After being showered with rose petal confetti, the newlyweds celebrated the wedding reception at Leslie&apos;s family&apos;s nearby ancestral castle. Guests at the wedding included co-stars from the couple&apos;s time together on Game of Thrones, such as Peter Dinklage, Maisie Williams, Sophie Turner and Emilia Clarke. In an act of style rebellion, Game of Thrones co-stars Sophie Turner and Maisie Williams challenged the conventional wedding dress codes. Sophie Turner, 22, dressed in a fierce red playsuit with knee-high boots and tiny red sunglasses, while 21-year-old Maisie Williams wore a black jumpsuit with a purse embellished with a crab. Sophie Turner wore a rebellious outfit to the ceremony. Image: Getty. In the ‘Forthcoming Marriages’ section, the newspaper announced the upcoming nuptials of a “Mr K.C. Harington and Miss R.E. Leslie”. Want to know how to get married without going broke? Listen to the podcast below.